Throughout the year many Hoosiers visit local festivals, heritage days and other events celebrating pioneer settlers. It is an opportunity to learn about history and share a spirit of community. While Indiana was not settled in the same manner as the original colonies, there were many pioneering people who moved into the territory that would become the Hoosier state. According to the Merriam-Webster Dictionary, a pioneer is “one of the first to settle in a territory.” By the mid-1800s, Indiana was mostly settled, and many of those first pioneers began gathering at “old settlers” meetings where they recalled their history and honored the oldest among them. According to the September 1907 issue of the Indiana Magazine of History, the earliest recorded old settlers’ meeting in Indiana took place in 1852 at the city of Madison, inviting all who had lived in Jefferson County as of 1820 or before. Old settlers’ meetings were announced in town and city newspapers around the state. Luckily for researchers, it is becoming easier to find accounts of those meetings as more and more historical newspaper issues are added to digital collections such as Hoosier State Chronicles, Newspaper Archive and Newspapers.com. 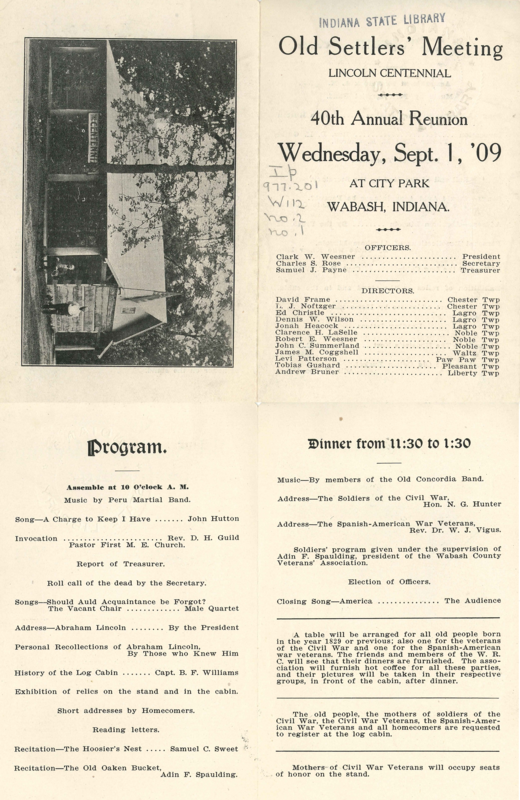 As the old settlers’ meetings were organized into formal associations and societies, this drew the interest of the Indiana State Board of Agriculture, the organizers of the Indiana State Fair. In the summer of 1878, the Board of Agriculture formed a committee to plan a State Pioneer Convention for Oct. 2, 1878 during the state fair. The announcement of the Pioneer Association of Indiana stated that “all pioneers seventy years of age, who have been residents of the state forty years, will be admitted free to the state fair.” This was the first statewide effort to recognize and enumerate Indiana’s pioneers. Notable speakers attending were poets James Whitcomb Riley and Sarah T. Bolton, and their poems were reprinted in the 1878 proceedings that were included within the Board of Agriculture’s annual report. Of particular interest to family researchers is the “List of applicants for membership,” twelve pages listing, name, address, age and years in state. The success of the inaugural meeting led to another gathering of the renamed Indiana Pioneer Society at the 1879 Indiana State Fair. 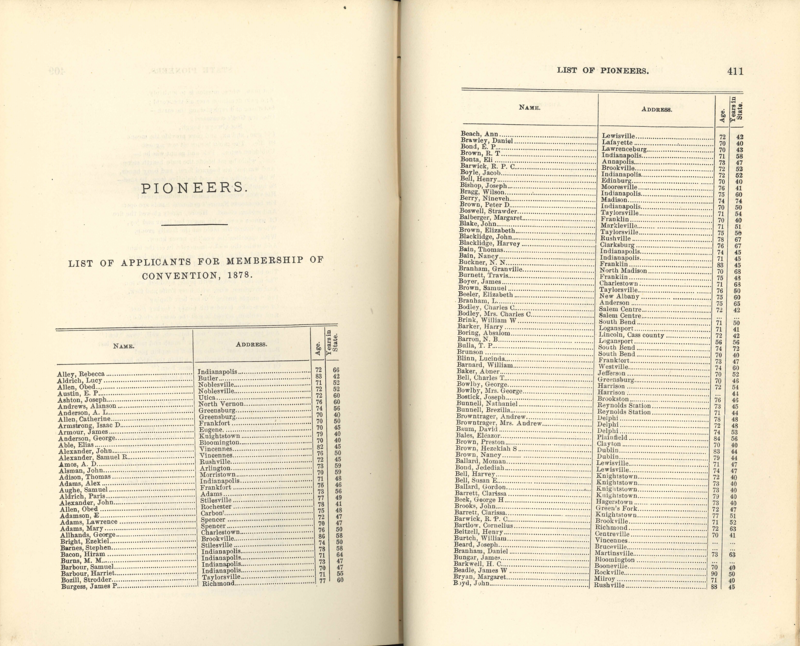 Four pages of members are listed in the 1879 proceedings. 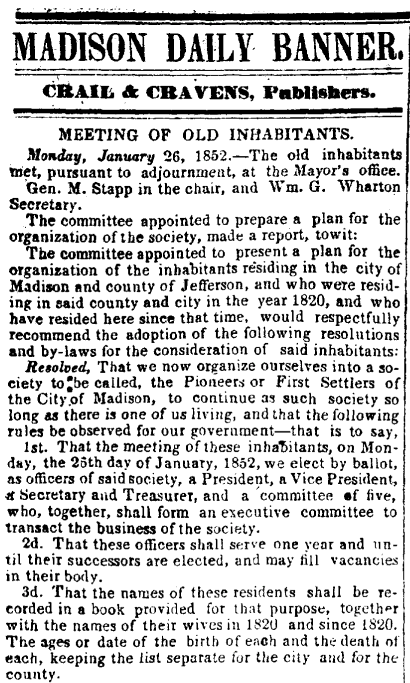 While the Indiana Pioneer Society did not have a third convention, its board continued meeting at least through 1885. The organization’s legacy continues because it raised the profile of local old settlers’ associations and promoted their efforts to compile county histories, many being printed in the 1880s. 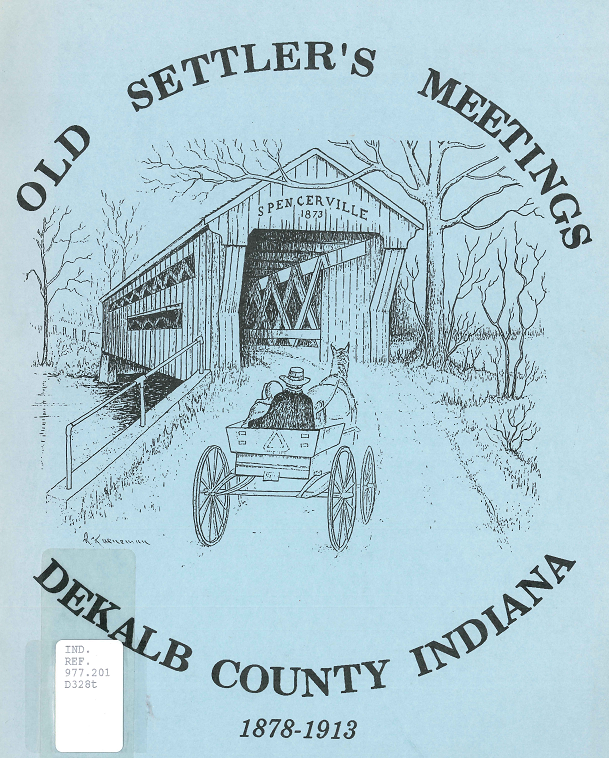 Various other relics of old settlers’ meetings can be found in the Indiana State Library’s collections, including souvenir programs, proceedings, pamphlets and bound compilations. In addition, look for links to digitized books in the County History Holdings guides. A letter printed in the May 13, 1896 Indianapolis Journal from J. W. Hervey, of Indianapolis expressed a wish to restart the state pioneer association. However, this did not happen until the 1916 state centennial celebration, when an interest was re-kindled by descendants of Indiana’s old settlers. As a result, the Society of Indiana Pioneers was formed and exists to this day.